I have not talked much about bicycles and cycling — what it is like to ride a bike in Berkeley or my observations while on a bicycle — because this is, after all, a walking blog. However, I do have noticed a few things about this subject while out on walks. First of all, there are many bike lanes and bicycle boulevards in Berkeley, mostly in the flatland areas. Cyclists do not generally need to go too much out of the way to ride on streets that accommodate bicycles, and can connect lanes and boulevards to find an easy route across town. Because of the bike routes and the flat roads, there tend to be all sorts of people out on bicycles, and all varieties of bicycles from fancy to rusty. In the Berkeley hills, however, there are only a handful of roads that are popular bike routes (Spruce, Euclid, Grizzly Peak, and Wildcat Canyon), and in the Claremont area, most cyclists travel from Russell Street up Tunnel Road (with a few connecting to Tunnel from The Uplands). In contrast to the flat areas of Berkeley, in these hilly areas I have mostly seen only cyclists who are out riding for exercise on road bikes. The bicycle boulevards are signed, often with the distance to destinations such borders with other cities, BART stations, points of interest, parks, and schools. This is handy for me as a walker, as well, to know the distances to different landmarks. I have also found that I really enjoy walking on the bicycle boulevards because it is fun to see what bicycles people are riding, what they are carrying, and what types of people are out on bikes. Admittedly, it is also more pleasant to hear the sounds of bicycles and people laughing and talking than only cars whizzing by. Last night I realized that another thing I like about the bike boulevards is the increased level of safety provided by them. I don’t often walk alone at night, but yesterday I went to a meeting that finished after dark and was walking home along Milvia Street. Other side streets seemed deserted, but Milvia was just the opposite because of the number of people on bicycles. Extra people and extra light (from streetlights and bicycle lights) made the walk enjoyable. I was reminded of another idea from Jane Jacobs’ The Death and Life of Great American Cities, which I mentioned in my last post about parks: that streets that have a high concentration of people coming and going at different hours of the day and night are safer and more pleasant. In keeping with my aim of trying to observe as much around me as possible while walking, I have looked at lots of cars around town even though I would prefer not to think about them too much. I would much rather look at more bicycles. Although I have seen lots of bicycles whizzing by on the road, I have not had a chance to look at too many up close. Like most American cities and like most college towns, bicycle theft is a regular occurrence here. 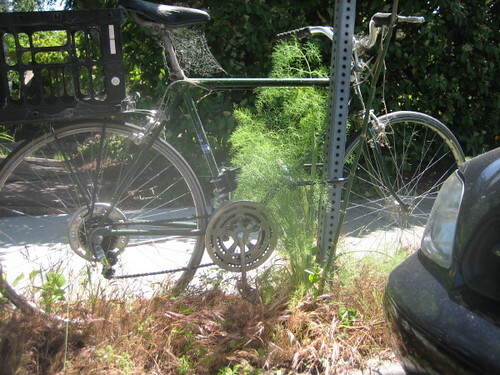 For that reason, most people do not leave nice bikes locked up anywhere. Any bicycle that is halfway decent or that has quick-release parts is likely to be taken in part or in whole. Mostly what I see locked to bike racks are beat-up bikes or bikes with various parts missing. At some cafes with outdoor seating, there will be higher concentrations of bicycles because owners can keep an eye on them. Also, there is a Bikestation in the downtown Berkeley BART station that provides secure bike parking on weekdays. A couple of weeks ago I finally started reading a book that had been on my list for years now, Jane Jacobs’ The Death and Life of Great American Cities. If you read anything related to city planning, neighborhoods, community, and the like, it will likely contain quotes from this book. I am only about a third of the way through, mainly because it so though-provoking that I am finding it easier to read it in small pieces. Now this book is about large cities, but it is still interesting to think about Jacobs’ ideas and how they apply to a smaller city like Berkeley. After reading the book’s chapter on parks, I spent some time thinking about all of the parks I have visited while walking throughout Berkeley. The first thing I had observed while walking is that Berkeley has quite a few parks for a small city; I think most of my walks ended up passing at least one park, if not a few. Second, Berkeley has a mix of general use and specialized parks. Some of the specialized uses include the Adventure Playground (tools and building experiences for children), boating at the Aquatic Park, kite flying at Cesar Chavez Park, bouldering and rock climbing at the rock parks, skateboarding ramps at Harrison Park, and off-leash dog areas at Cesar Chavez and Ohlone parks. Playing fields and courts for various sports are available at several parks. Despite my observations about lots of people being out and about at all times of the day in Berkeley, I have found that most of the parks are not filled with people all day long. The city has several “tot lots,” which are small parks with playground equipment, but many are fairly empty during the daytime hours. One exception is Virginia-McGee Totland, which has a huge selection of toys and play equipment and seems to be packed with children and parents all day long. Totland may explain part of the absence of crowds at the other parks (it definitely appears that people come to Totland from other neighborhoods to for the social and play opportunities), as does the great number of children who go to pre-school these days. Adults who have leisure time during the day are more likely to be at the numerous cafes around town. Would this change if wireless Internet access where available throughout town? And what if there where coffee carts located at or within a block of some of the parks? The Sea Breeze Market/Deli is a good example of this in Berkeley, as it is a nice coffee and snack stop for cyclists and walkers coming over the bicycle bridge and to the Berkeley Marina, (although many people also stop there in their cars getting off the freeway, and then drive the rest of the way to the Marina). In San Francisco, I’ve witnessed many people picking up some coffee at the Blue Bottle Coffee kiosk in San Francisco and taking it over to the Hayes Green (which I highly recommend visiting if you are interested in successful parks/public commons). I don’t walk through parks at night, but during the day most of the Berkeley parks I visited seemed safe. One park, Greg Brown, has limited hours and has been locked up when I have walked in the neighborhood. It is pretty secluded, and I imagine the closing is due to concerns about drug dealing and other illegal activity in the park after dark. Previously I had mentioned my concerns about safety at the Aquatic Park. After reading Jacobs’ writing about parks, I realized that the location of the park has much to do with this. Because it is at the waterfront near the edge of the city, you don’t walk through the park to get to anything else. The railroad tracks further isolate the park because it cannot be accessed at every east-west street it intersects. It will be interesting to see what happens at the south end of the Aquatic Park once the West Berkeley Bowl opens a few blocks away and brings lots of people to the area at all hours of the day. Will more people visit or will they not even realize there is a park a few blocks away? If you are interested in learning more about some of the parks I have mentioned here and in past entries, Berkeley Partners for Parks has organized a series of events to celebrate the centennial of the city’s parks. This Sunday, a fundraiser will be held at the Aquatic Park, and there will be an opportunity that day to walk at future site of the labyrinth that the East Bay Labyrinth project hopes to build, and a fall equinox celebration at Cesar Chavez Park’s solar calendar. Other park events will be happening through mid-November and are listed on the website’s calendar. Another fun project for learning about the parks and city would be to visit a different Berkeley park each week; conveniently Berkeley has 52 official parks! Even if you have been to all of the parks, I recommend visiting them again and at different times of the year. You never know what interesting things you will find, such as the strange scene (pictured below) that I came upon last year, at Oak Park, with a felled oak tree! I did not originally imagine writing anything about the exercise aspects of walking because it seemed pretty obvious that one of the main reasons people walk is to get exercise. But then I remembered that at one point it wasn’t so obvious to me that walking was a way to stay fit. From about age 12 and through college and beyond, I did quite a bit of running for fun and exercise. Soon after college, while working for a nonprofit organization, I got to know a (I thought at the time) middle-aged woman who was a regular and enthusiastic volunteer for the group. She was active in race-walking, a competitive sport that involves walking very fast. One day I got a chance to look at some of her race result clippings, and was surprised to see her listed in the 70-79 age group! This was a turning point for me to realize that walking could be good exercise and to see an example of someone who — at least partially as a result of walking — was enjoying an active and rewarding retirement and had the energy to do volunteer work and pursue other interests later in life. Another aspect of walking for exercise is the treadmill. I have met a couple of people who enjoy walking on the treadmill indoors at the gym, but many more people find it to be incredibly boring. Here in Berkeley, it is a rare day that one would be forced indoors to a treadmill due to weather conditions, and walking outdoors is an option year-round. For those who do not enjoy gyms or cannot afford a membership, walking outdoors for fitness is an option here in the Bay Area with its usually mild climate. One of the coolest ideas I’ve heard of in terms of fitness programs is the Green Gym in England. The idea is to meet regularly to do volunteer work that is physically active, such as gardening or environmental conservation. The sessions start with warm-up exercises, and the participants get the benefit of both exercise and volunteering for their community! I think that the Green Gym is a great concept that could be combined with walking and applied here in Berkeley. I imagine starting at a transit-friendly meeting place, walking to the volunteer location as a warm-up, and then doing active volunteer work. This program would be a great collaboration with the Berkeley Partners for Parks, which amongst its member groups would offer opportunities for habitat restoration, creek cleanups, path-building, garden work, and much more. Walking to the locations would fit in with Berkeley’s climate action goals outlined in Measure G.
What if you really want to walk for exercise, but live somewhere that is unsafe or otherwise inhospitable to walking? If you work or go to school in a different neighborhood, you could take your walks from that location. Think about any other locations you visit regularly; could you walk in those places? Another option is to check the transit routes near where you live to see if you can ride the bus or train to a location that is better for walking. Coming soon, I will post some additional ideas about walking safety that have come up throughout the course of the Berkeley walk.